I read this article and found it very interesting, thought it might be something for you. 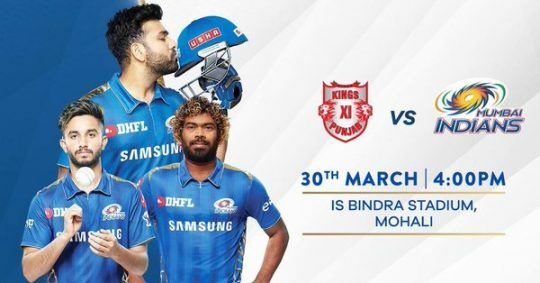 The article is called Kings XI Punjab vs Mumbai Indians [MI v KXIP] IPL 2019 live score, streaming, highlights on Star Sports and is located at http://www.panasiabiz.com/10208/kings-xi-punjab-vs-mumbai-indians-mi-v-kxip-ipl-2019-live-score-streaming-highlights-on-star-sports/. Kings XI Punjab and Mumbai Indians clash at the IS Bindra Stadium, Mohali on Saturday, March 30, 2019. This is a day/night match and will start at 4 PM IST. Mumbai Indians 69/2 in 7.4 overs. Rohit Sharma led Mumbai team would like to build on the win they got against the Virat Kohli led Royal Challengers. Watch MI vs KXIP live streaming on Hotstar.com here.
.@mipaltan are in Mohali to face @lionsdenkxip, where are you? It was a controversial end to the game when the umpire failed to give the last ball of the game by Lasith Malinga a no-ball when De villiers was on the strike and they needed a sixer off the last delivery. Had the umpire s[potted the no-ball, the result would have been probably different with a free-hit. Even though Virat Kohli lashed out at the umpire for not giving it a no-ball and calling for more technology to look into no balls, the damage had been already done. Many sports legends criticised the umpire and called for an exclusive third umpire to look into every delivery if it is a no-ball, the on-field umpire might distracted with so many things and may not spot it at times. Both these teams are with two points after winning and losing a match each. Punjab were blown away by the Knight Riders in Kolkata after conceding 218-4 – which is the highest total in IPL at the Eden Gardens. Viewers in India can watch the match live on Star Sports HD channels with live streaming only on Hotstar.com. Matches – 22, Kings XI Punjab won – 10, Mumbai Indians won – 12.